It is now 12:30 a.m.; I’ve just finished packing up the last copy of The Scroll, and the editor has asked me to write few words about it. My tiredness is gone; I'd love to share with you what we are doing here. About four years ago, we at Chabad.org decided it was time to put some of our great content into print. Even with all sorts of e-readers blossoming, many people still enjoy the feel of actual paper. Plus, it would be accessible on Shabbat when we're not using computers. 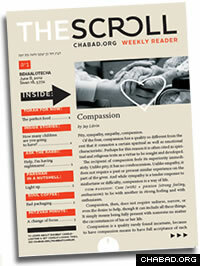 So after an initial pilot, we launched Think Jewish, the weekly print publication of Chabad.org. The response has been tremendous. Looking quickly through our mailing list, I realized we have a subscriber in every single state of the U.S.! Almost every day we get another note from a happy reader. Some of them enjoy the article about the parshah, others like the story, and yet others love the "mitzvah minute" section, which provides quick and easy information on various Jewish practices. This week, we are launching an all-new redesign of the publication. It is now called The Scroll and has a beautiful, modern look. I invite you to click here to download a sample issue and to subscribe. You can also give The Scroll as a gift to a friend - you'll be glad you did! The latest news from Chabad.org. The Key to Living Jewishly is Coming to WhatsApp!